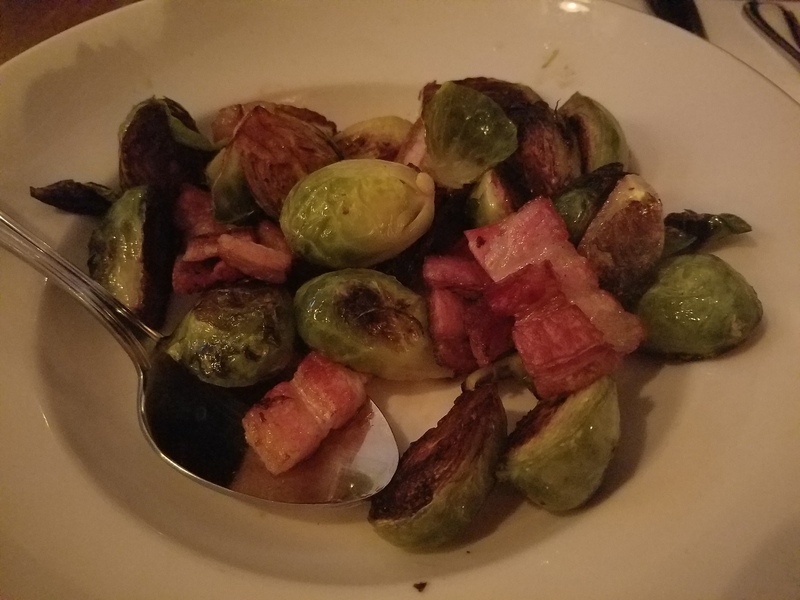 We started off with brussels sprouts and bacon. The sprouts weren’t quite caramelized enough for Hubba Hubby; the bacon was in huge savory chunks that helped liven up the sprouts but I don’t think Hubba Hubby loved this dish. I thought it was fine, though definitely could use improvement (though I think some people like it the way it is — I say this because it reminds me strongly of how my sister serves her Brussels sprouts). 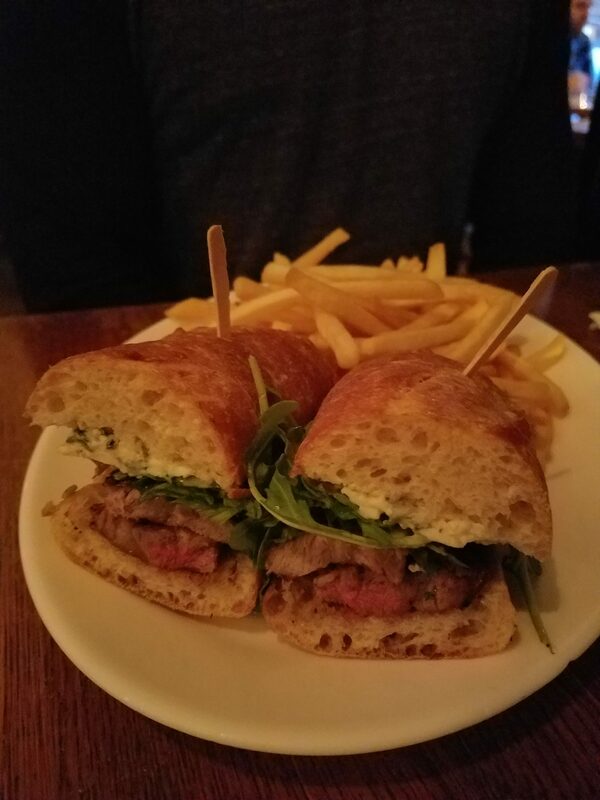 Hubba Hubby chose the steak sandwich — I didn’t try any of this, though I recall it had gorgonzola on it (probably why I didn’t try it). He liked it fine, though said it was seasoned aggressively. The fries were really good though (visible in the background) — I definitely ate a bunch of those! Nothing really jumped off the page at me, so I finally settled on roasted (grilled?) salmon with cauliflower mash and asparagus. I know — it sounds like diet food, right? Maybe it is. But — aside from being a little mild in seasoning/salt on the salmon — I really, really enjoyed this dish. 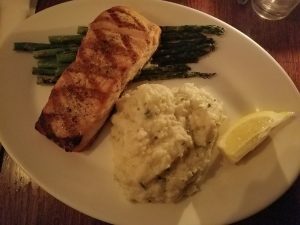 The salmon was cooked really nicely (medium rare as requested) as was the asparagus… and the cauliflower mash was ridiculously good!! Creamy and tons of cauliflower flavor, without being bland. I really enjoyed this dish, though you might suggest that I could easily make this at home – and I can. Sooo, how did Jack & Nellie’s fare for dinner? Service was again a little odd, and the place is still (unsurprisingly) very loud. I liked our food to varying degrees, as did Hubba Hubby; I’m in no rush to return but I’m happy that I went. I can definitely see it becoming a standby/backup place when I don’t know what to eat in the area, but I don’t think it’ll be replacing any of my local favorites anytime soon. If you’ve been there and think I should have tried something else that would blow my mind — let me know in comments!